First cut a 6" x 9 1/2" piece of dark purple card stock and fold it in half for the base, a 4 1/2" x 5 3/4" piece of light purple for the first layer, a 4 1/4" x 5 1/2" piece of white for the front layer, a 3 1/8" x 4 3/8" piece of dark purple for the center first layer and a 3" x 4 1/4" piece of white for the center front layer. Next dry emboss the larger piece of white card stock with a Stampin' Up! 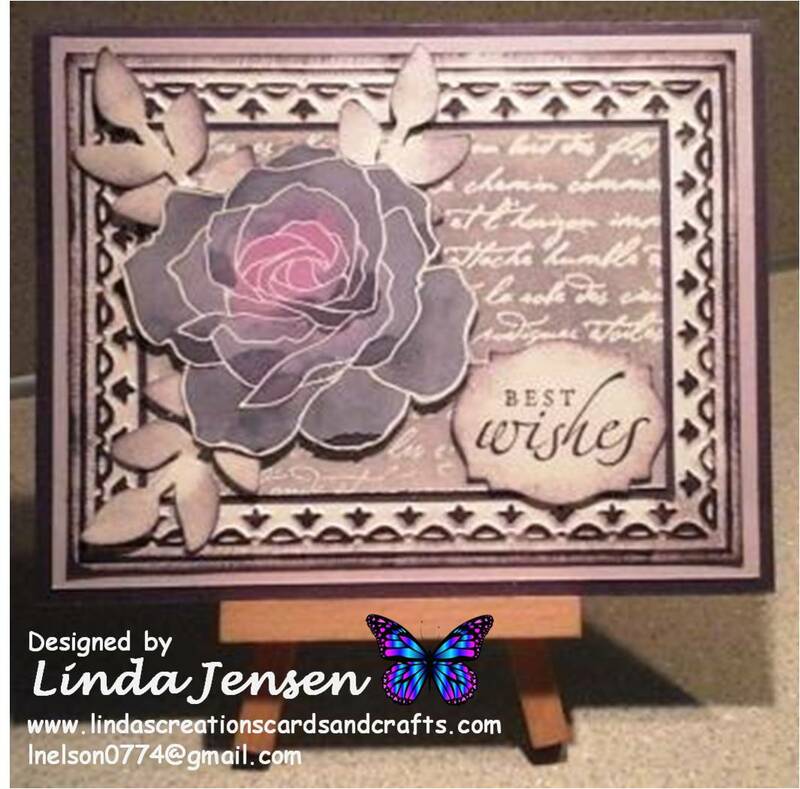 Framed Tulip embossing folder, sponge the edges and raised areas with Stampin' Up! Elegant Eggplant ink and set it aside. Then heat emboss the white center layer with a Stampin' Up! French Script background stamp, Versamark ink and white embossing powder. Next sponge over the embossing with Elegant Eggplant ink then wipe the ink off the embossing with a paper towel, attach it to the center first layer, then to the front layer and set it aside. Next cut out the leaves with Stampin' Up! Secret Garden Framelits Dies, sponge their edges and attach them to the center layer with mini pop dots. 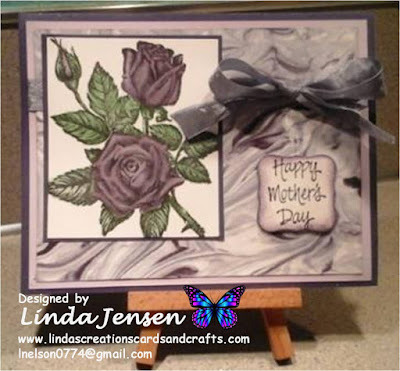 Then heat emboss the rose on glossy white card stock with Versamark ink and white embossing powder then color it with the floating re-inker watercolor technique. Click here for an awesome video tutorial. The Stampin' Up! re-inkers that I used are Lovely Lilac and Orchid Opulence. When completely dry cut out the rose and attach it over the leaves with mini pop dots. Next cut out the sentiment with a Spellbinders Labels Eighteen die, sponge it's edges with Elegant Eggplant ink, stamp the sentiment with the stamp from a Stampin' Up! Sincere Salutations set, attach it to the center front layer, finish assembling the card and enjoy!